Dog days of summer getting you down? Why not treat yourself to a story about one of the first families of ice cream in 19th century Philadelphia? Learn how a modest ice cream shop went head to head with New York’s famous Delmonico’s to become one of the finest restaurants in America. A special feature from The Feast this week, in collaboration with Becky Diamond, author of “The Thousand Dollar Dinner”, we’ll cool you down with some scandalous vanilla ice cream and take you behind the scenes of one of America’s first great cookery challenges. Victorian food expert Becky Libourel Diamond carefully cut small slices of peach pie, taking care to remove the pits and set them aside. On with the Road Show! In 1851, fifteen wealthy New Yorkers wanted to show a group of Philadelphia friends just how impressive a meal could be and took them to Delmonico’s, New York’s finest restaurant. They asked Lorenzo Delmonico to “astonish our Quaker City friends with the sumptuousness of our feast,” and assured him that money was no object, as the honor of New York was at stake. They were treated to a magnificent banquet, enjoyed by all. However, not to be outdone, the Philadelphia men invited the New Yorkers to a meal prepared by James W. Parkinson in their city. In what became known as the “Thousand Dollar Dinner,” Parkinson successfully rose to the challenge, creating a seventeen-course extravaganza featuring fresh salmon, baked rockfish, braised pigeon, turtle steaks, spring lamb, out-of-season fruits and vegetables, and desserts, all paired with rare wines and liquors. Midway through the twelve-hour meal, the New Yorkers declared Philadelphia the winner of their competition, and at several times stood in ovation to acknowledge the chef ’s mastery. Description courtesy of Westholme Publishing. PA Books airs Sunday nights at 7PM. Studying journalism while at Rider, Becky Diamond ’90 had a true love for writing. She also had a serious interest in the culinary arts and found a way to combine her two passions into a successful career. She has just released her second book. Author Becky Diamond, trained at Rider and Rutgers, recounts 1851's epic "Thousand-Dollar Dinner" between New York and Philadelphia. When the one-upmanship grew more serious, two titans of the table were recruited to dole it out: Lorenzo Delmonico, the New Yorker who presided over one of the finest restaurants in the nation, and Philadelphia restaurateur James Parkinson, who was told not to worry about cost. Since the results are known — the New Yorkers stood and applauded chef Parkinson’s meal midway into their 12-hour dinner — the book’s main entree is a chapter-by-chapter description and historic overview of each of the 17 courses, making the book a fun history of food and culture. The Thousand Dollar Dinner, $26, Westholme Publishing. 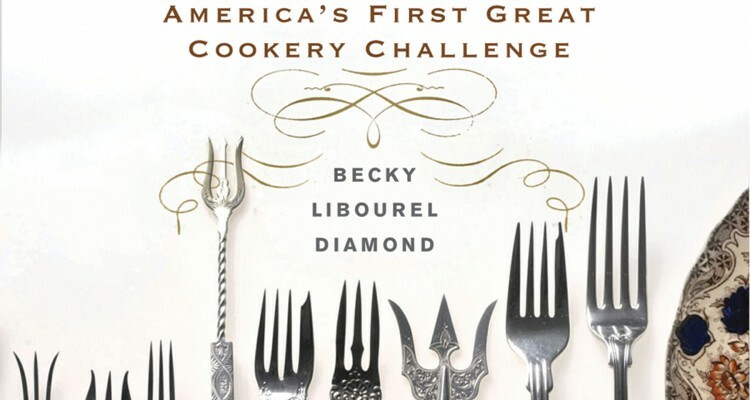 Diamond speaks at Princeton Public Library, Thursday, January 7, 7 p.m.
​PRINCETON — Author and research historian Becky Libourel Diamond will discuss her book, "The Thousand Dollar Dinner: America's First Great Cookery Challenge," Thursday, Jan. 7 at 7 p.m. at Princeton Public Library. ​The holidays are fast approaching, and you might be scratching your head over what to get that foodie/techie/futurist/history nerd you love so much. From stories of shipping containers, to molecular gastronomy, to one killer dinner party in 19th century Philadelphia, we’ve compiled a list of our favorite food books that look at how we eat (and have eaten) in an unusual light. In 1851, a friendly competition between a group of New Yorkers and Philadelphians culminated into a thousand dollar dinner for the win. Diamond details the 12 hour long, 17 course meal, in all its decadence using fascinating and detailed historical research. DECEMBER: A mouthwatering tale of one luxurious 1851 dinner. Becky Libourel Diamond, a native of Southampton, with a display of her new non-fiction book " The Thousand Dollar Dinner" at Barnes & Noble in Fairless Hills, Pennsylvania. In a culinary duel, the Philadelphia restaurateur pulled out all the stops in an effort to prove that his city’s fine dining scene could compete with that of New York City. The wealthy food lovers who attended Parkinson’s 17-course meal, served over 12 hours, were impressed. Yardley, Pa. (November 6, 2015) – Local author Becky Libourel Diamond will kick off her fall book tour on Nov. 14th at the Ebeneezer Maxwell Museum in Philadelphia, followed by a book signing Nov. 21st at B&N in Fairless Hills. Diamond will discuss and sign her new book, The Thousand Dollar Dinner, the tale of an unusual 19th century duel between the two cities considered at the time to be the culinary capitals of the United States – Philadelphia and New York. James W. Parkinson, 19th century Philadelphia restaurateur, in The Confectioner's Journal, 1875. By Linton Weeks, NPR History Dept. "The tradition of lavish, super-indulgent dinners in America, says Becky Libourel Diamond, author of the soon-to-be-published book The Thousand Dollar Dinner, comes from the fact that our country has always been known as the Land of Opportunity for Pursuers of Happiness. Pass the champagne and caviar. In 1851 two rival groups of foodies challenged each other to a culinary duel. The New York and Philadelphia “clubs of good livers” each hosted the other in their home city to judge which one could deliver the most outstanding feast. The first banquet was held at Delmonico’s famous New York City restaurant, but the bizarre, decadent 12-hour, 17-course gorgefest held in Philadelphia and prepared by Chef James Parkinson was dubbed by Philly newspapers as the “Thousand Dollar Dinner” because it allegedly cost the Philadelphians $1,000 (approximately $32,000 in today’s dollars) to prepare. Local Yardley author, Becky Libourel Diamond, examines the life and impact of Elizabeth Goodfellow, a 19th-century pastry chef and caterer who not only started America’s first cooking school in Philadelphia, but also invented the lemon meringue pie and created the format for today’s written recipes. In her latest book, Mrs. Goodfellow: The Story of America’s First Cooking School, Ms. Diamond weaves the aromas and colorful array of fruits and vegetables of Philadelphia’s markets with Mrs. Goodfellow’s lessons on the art of cooking. Ms. Goodfellow also popularized regional foods, such as Indian (corn) meal, and presaged modern society’s interest in farmer’s markets by stressing the use of wholesome ingredients that are locally grown. Published by Westholme Publishing, also in Yardley, Mrs. Goodfellow: The Story of America’s First Cooking School is available from the publisher, Amazon, and Barnes & Noble. HARRISBURG, Pa., Nov. 9, 2012 /PRNewswire-USNewswire/ -- The Pennsylvania Historical and Museum Commission (PHMC) will hold its seventh annual Holiday Marketplace on Thursday and Friday, Nov. 15-16, in the atrium of the Commonwealth Keystone Building, 400 North St., Harrisburg. Open to local residents and employees working in or near the Capitol Complex, the Holiday Marketplace showcases Pennsylvania-themed holiday gifts from a number of PHMC's historic sites and museums across the state. Products include hand-crafted items such as beeswax candles, holiday decorations, reproductions of vintage toys and games, books, pottery, and maple sugar candy. This year, Ephrata Cloister, Landis Valley Village and Farm Museum, Pennsbury Manor, Somerset Historical Center and The State Museum Store will be participating. The Pennsylvania Capitol Preservation Committee, Pennsylvania Department of Community and Economic Development, and the state Department of Conservation and Natural Resources will offer items that reflect and support Pennsylvania's heritage and natural beauty. The Keystone Cafeteria will offer seasonal fare. Two special presentations during the Marketplace will highlight Pennsylvania's agricultural and culinary heritage. Author Becky Diamond will speak about her book 'Mrs. Goodfellow: The Story of America's First Cooking School' on Nov. 15 at 12:15 p.m.
Mark Ware of Somerset Historical Center will present a maple sugaring demonstration on Nov. 16 at 12:15 p.m.
Holiday Marketplace hours are 10 a.m. to 3 p.m.
For more information on Holiday Marketplace, visit: www.paheritage.org. Posted: Tuesday, October 2, 2012 11:42 am | Updated: 3:17 pm, Tue Oct 2, 2012. Yardley resident Becky Libourel Diamond will treat guests to a taste of the past during her fall book tour. Original 19th century recipes from America's first cooking school will be prepared over an open fire at Newtown's Market Day, and Diamond will conduct a cooking class at Whole Foods Market in Princeton N.J. She'll also be signing copies of her new book, "Mrs. Goodfellow: The Story of America's First Cooking School," at the Newtown Bookshop and Doylestown Bookshop, as well as Barnes & Noble stores in Philadelphia and Cherry Hill N.J.
Long before Julia Child and Martha Stewart became household names, another little-known culinary talent, Elizabeth Goodfellow, was significantly impacting American cookery with a series of gastronomic firsts. People came from all over the country to shop and stroll the markets. Yardley, Pa. (September 4, 2012) – The Library Company of Philadelphia will host local author Becky Libourel Diamond on September 13, at an event co-sponsored with the Historical Society of Pennsylvania. Ms. Diamond will discuss her new book, Mrs. Goodfellow: The Story of America’s First Cooking School. She’ll provide a behind-the-scenes look at what it was like to be a student under this culinary innovator’s tutelage. Philadelphia can claim many firsts, but few may realize the city’s impact on today’s culinary instruction. America’s first cooking school thrived in the early 1800s on Dock Street. Established and run by Mrs. Elizabeth Goodfellow, its influence can be followed to today’s celebrity chefs and the nation’s top culinary institutes. Ms. Diamond conducted much of the research for her book at the Historical Society of Pennsylvania and Library Company of Philadelphia archives. The lecture will be accompanied by a display of documents from the Historical Society of Pennsylvania’s collection, including several historic cookbooks. The event, which is free and open to the public, begins at 6 p.m. at the Library Company of Philadelphia, located at 1314 Locust Street, Philadelphia. Those interested in attending can register at http://goodfellow.eventbrite.com. Historical Society of Pennsylvania members can purchase Mrs. Goodfellow: The Story of America’s First Cooking School at the event for a 20% discount. Published by Westholme Publishing, Yardley, Pa., the book is available from the publisher, Amazon, and Barnes & Noble. Becky Libourel Diamond writes professionally for a number of publications. She most recently contributed to the book Storied Dishes: What Our Family Recipes Tell Us About Who We Are and Where We’ve Been. Ms. Diamond lives in Pennsylvania with her husband and children.